Oscar winner Robert De Niro hits the silver screen this month in ‘Hands of Stone’, a new film about Roberto Duran and his arch-rival Sugar Ray Leonard’s battles for the WBC Welterweight crown. 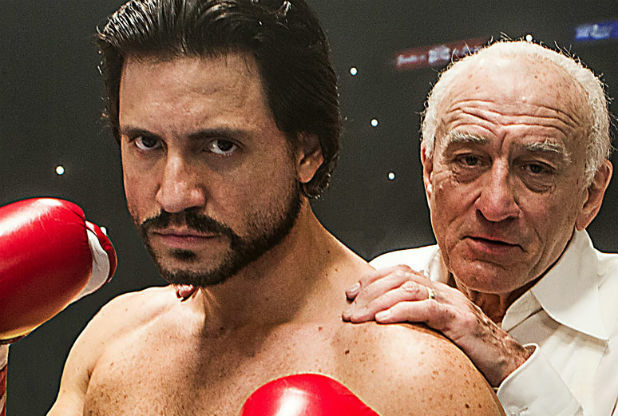 De Niro will be playing Duran’s trainer Ray Arcel. Arcel is arguably the greatest trainer in boxing history, with 20 World Champions having come under his care. What most film-goers won’t be aware of is that Arcel learned the tricks of his trade from a prickly ex bare-knuckle fighter from Swansea named Dai Dollings, who trained countless early British boxing champions. Dollings was well known in the 1890’s as a fearsome fighter, and claimed to have had 100 battles with the gloves, and 30 illegal bare-knuckle fights at dawn against the legendary ‘mountain fighters’ of South Wales. 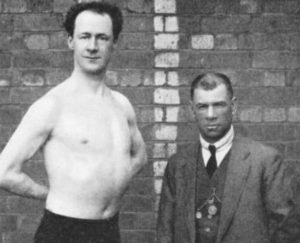 After turning to the role of boxing trainer, renowned British champions such as Tom Thomas, ‘Peeless’ Jim Driscoll and Ted ‘Kid’ Lewis fell under his care. Dollings’ fame spread across the Atlantic after he masterminded the shock victory of Londoner, Matt Wells over the lightweight champion of the world, Freddie Welsh, in 1911. After immigrating to the United States in 1914, Dollings became the chief trainer at Grupp’s gym in New York, where a young Ray Arcel was beginning to harbour a desire to become a boxing trainer. Notoriously tight with money, Dollings trekked five miles to the gym every day, rain, snow or hail, rather than spend a nickel on the street car. Complaining about the softness of life in the States, the Welshman would often enter the gym grumbling, “You bloody Americans, you’re made of tissue paper”. Dai Dollings (R) with one of his fighters. It was on these long walks to and from the gym that Ray Arcel started jogging along at Dollings’ elbow and quizzed the belligerent trainer about the fight game. At first, Dollings was reluctant to share the secrets of his trade, and asked Arcel ‘over and over’ why he wanted to be a trainer. Dollings would eventually tell Ray that if he wanted to be a trainer, he had to commit to being the best, or not to bother at all. The long walks and pestering continued, until the day finally came when Arcel knew he had made a breakthrough when the ex-knuckle fighter told him that he didn’t want to be a trainer, but that he wanted to be an ‘analyst’. Dollings impressed upon Arcel the necessity of viewing every boxer as an individual. Where scolding could work for one fighter, it might harm another. The key was to study the habits and the temperament of each boxer to devise a tailored approach. A notoriously hard man, Dollings had little time for ‘brittle’ fighters, once complaining at ringside that his fighter was ‘a hothouse bloody flower’. The analysis proved correct – the ‘flower’ wilted in the fourth round. By the 1930’s he was one of the best known boxing trainers in the United States. A decade later he still working six days a week at Grupp’s, and was seconding fighters in the evening at the age of 83. Dai Dollings’ longevity as a trainer was almost matched by Arcel himself, who at 82 worked his last corner assisting Larry Holmes in his successful title defence against Gerry Cooney in 1982 at Caesars Palace. Given his frugal reputation it might be wondered whether if Dollings was around today he could be persuaded to pay a fistful of dollars to watch ‘Hands of Stone’. If he did I am sure the old bare-knuckle fighter would crack a rare smile and conclude that his pupil, Ray Arcel more than fulfilled his professional commitment to being the best boxing trainer and ‘analyst’ he could be. The story of Dai Dollings is explored in greater depth in a new book by Lawrence Davies called Jack Scarrott’s Prize Fighters – Memoirs of a Welsh Boxing Booth Showman, which is published by Peerless Press.